I’ve always been a writer, ever since I was a little girl and used to write stories and staple the pages together to make my very own book. I loved reading and everything that went with being a budding author, but quite strangely it took me until the age of 20 to realise that this is what I wanted to be. Until then I thought I wanted to be an actress, and it wasn’t until I realised that I loved writing the application letters far more than I liked the auditions, that I realised that perhaps my future lay in writing, not the performing arts. By the time I realised what I wanted – or needed – to be, I was working in an office, doing a job I hated. Unbelievably, I was there for seventeen years because I didn’t want to just leave to go into another office job; I wanted to leave to become a writer. Some of my colleagues were supportive of my dreams while others, I have to say quite openly, laughed at my plans and told me I’d never leave. “You’ll be here until the company shuts down,” was something I heard on a very regular basis. Still I persevered, and in 1995 I had the great fortune to have a small book published professionally. Strangely, even this was met by scorn from some of the people I worked with. One read an interview I’d given to a newspaper and said, “This makes it look as though you’re a writer, when really you’re just an office assistant…” While another criticised my grammar whilst reading the Acknowledgements chapter, (most likely because he was annoyed I hadn’t thanked him.) Don’t get me wrong, there were a few people who were very supportive and happy that I’d had a book published, but there were many more that poured scorn over my dreams and made it clear that this was purely a one-off episode, never to be repeated. For a time it looked as though they were right. I wrote a few novels and one of them was picked up by an agent – only to be put down again after six months when she left the agency. Then an editor said she liked it and wanted to publish it, which thrilled me to no end. Unfortunately, Bridget Jones’ Diary suddenly appeared on the bestseller lists and the publisher’s marketing department decided that the books were too much alike, and they had to let me go. I had many episodes like this during the 1990s when I believed so much that something great was about to happen, only to have it crashing down around me over and over again. I felt heart-broken but knew that I could never give up. What else could I possibly do? I was a writer and nothing I could do would ever change that. Finally in 2003, I became pregnant with my daughter and my entire world changed. During my maternity leave I did a yoga teaching course and then, as if by magic, a yoga magazine started asking me to write articles for them. I combined the two, and from the money I made teaching yoga to children and writing articles, I was finally able to bid the day job good bye and go on my way. During the next eight years I helped raise my daughter and taught yoga to hundreds of children around my town. This paid my bills and in my spare time I still wrote. I was lucky enough to have a biography published in 2007 entitled, Marilyn Monroe: Private And Undisclosed; then I was offered a weekly column in my local newspaper, talking about my life and my occasional moans and groans. Things looked as though they were finally taking off and the good part was that I was now my own boss, which suited me down to the ground. At the beginning of 2012 I got my prayers answered when I saw a job advertised for a part-time publicist for an independent publisher, BearManor Media. 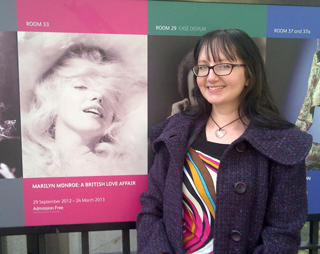 I knew I could do it – I’m passionate about books, I’m passionate about old cinema (which they publish books on) and what’s more, I had spent the past five years marketing my Marilyn Monroe book, so I had the experience. I applied and, thank goodness for me, the boss loved my enthusiasm and offered me the job. This not only cured my financial worries but also enabled me to work at home for most of the week, spending my time writing and working for BearManor, with only a couple of hours outside the house, doing the few yoga classes I had left. Getting my job with BearManor was a real turning point for me. Not only did it help me regain the confidence I had lost over recent years, but surrounding myself with other authors was totally inspiring and encouraging. I started to believe in myself and my abilities once again and about a month after I started my publicity work, I approached the manager of BearManor with a book idea I had – a biography of Carole Lombard. Unbelievably, he snapped it up and within thirty minutes of presenting him with the idea, I finally had a publisher! Then just two days later, I was minding my own business when an email popped in from my UK Marilyn Monroe publisher. I had sent them an idea for a Hollywood Scandals book several months before, and they were writing to say they loved the idea and wanted me to write it for them. Not only that, but they had already arranged for someone to publish it in the United States too. I was gob-smacked! So within the space of just a few days I suddenly had two books commissioned, but this wasn’t the end of my good luck. The same day I found out about Hollywood Scandals, I also heard that the paperback rights to my Marilyn Monroe book had sold to Bulgaria. By this point, I don’t mind telling you, my head was spinning and I could barely function because of the excitement. In May 2012 the revised paperback edition of Marilyn Monroe: Private And Undisclosed was published in the UK and USA. I was excited of course, but you could have knocked me down with a feather when one of my friends posted a photograph on my Facebook’s wall. The picture showed my book at number 17 in the W H Smith Bestseller charts. I was in shock and thought it must be a joke, but no – a quick trip into town showed me that this was no laughing matter. There was my book right in front of me, sitting at number 17 and looking extremely pleased with itself. Of course that sent my husband, my daughter and me into complete hysteria, and I’m sure the shop assistants wondered what on earth was going on as we jumped around in the aisles, screaming and taking photographs. It’s a wonder we weren’t arrested! To see my book in the charts, and to be able to finally call myself a bestselling author, was beyond anything I had ever dreamed of in my life. It was an amazing feeling and not one that I want to forget in a hurry. Since then, events have been moving so quickly that I have hardly had time to think: I’ve filmed a part in a forthcoming Marilyn Monroe documentary; I’ve done many book signings; I’ve appeared on numerous radio shows; written magazine articles and been featured in interviews; and to cap it all, I’ve also appeared on the Alan Titchmarsh show – a daytime chat show here in the UK. It really has been extraordinary. But perhaps the most amazing thing to happen was when I was asked to do a lecture at the National Portrait Gallery in London in October 2012. I was talking about Marilyn Monroe and, after travelling down with my parents, I had the time of my life. Not only was the talk so full, they were turning people away, but afterwards I did a book signing which saw me selling so many books, I lost count. One reader even rushed over to tell me she was from New Zealand and I was her favourite author – now that is something I thought would never happen in my lifetime, but oh my goodness, I’m certainly glad it did. The day ended with my agent telling me he loved a proposal I’d written for a future book, and he would be sending it out to publishers very soon. All being well, that will be picked up by a publisher next year but I must keep my fingers crossed and hope for the best! To say that this year has been one of remarkable good fortune and inspiration would be an understatement. I am now in a position with my writing where I was able to give up the remaining yoga classes I had, so that now I teach only one class – a brilliant half hour with my daughter and her friends, every Friday morning. That is truly a blissful thirty minutes and one I look forward to every week. In fact, my daughter’s school has just asked me to speak to their assembly – not about my yoga, but about being a writer and making dreams come true. I’m very happy to do that, and if I can encourage one child to never give up and to go after what it is that makes them happy, then I’ll be a very contented woman. I am a big fan of actress Bette Davis and it has always been my claim-to-fame that I was born on her birthday. This year, thanks to everything that has happened, I was finally able to buy something she owned – a book from her personal library. The seller didn’t say anything to me about there being writing inside, so you can imagine how excited I was when I opened the book and saw not only Bette’s writing, but a profound quotation – “We can dream can’t we?” This struck a chord for me, particularly after what has happened recently, and in a way it kind of felt as though it was a sign. I have spent my life dreaming of great things, and you’ll think I’m silly, but to me finding that quote really did mean something very surreal. 2012 has been a year where my dreams have come true, but of course I have much more I wish to achieve, and I’ll never stop striving and looking for the next goal and the next aspiration. I will be a writer for the rest of my life – it’s who I am and what I do, part of my DNA which can never be altered no matter what. But in spite of the happiness I have felt this year, and the success I have seen, there will always be a part of me that prays it will last. I’ve seen great disappointment – terrible lows and times where I didn’t know how I was going to get through. These feelings will never leave me, but perhaps that’s okay, because if I’d been handed everything on a silver plate, I’d never be as grateful as I am today; and I truly am grateful and will never take anything for granted. Not a day goes by when I don’t thank God for what is happening to me right now, and I just pray that it continues because I love my job, and don’t ever want it to end. Yes we can, and I will never, ever stop.